Cake originally made for Boo in Jan 2009. My youngest fell in love with Mickey Mouse just a couple of months after she turned one. 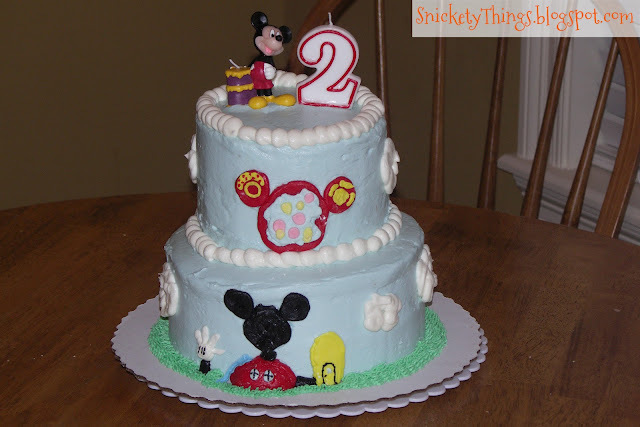 I asked her what kind of party she wanted when she turned two and she immediately said Mickey Mouse Clubhouse. 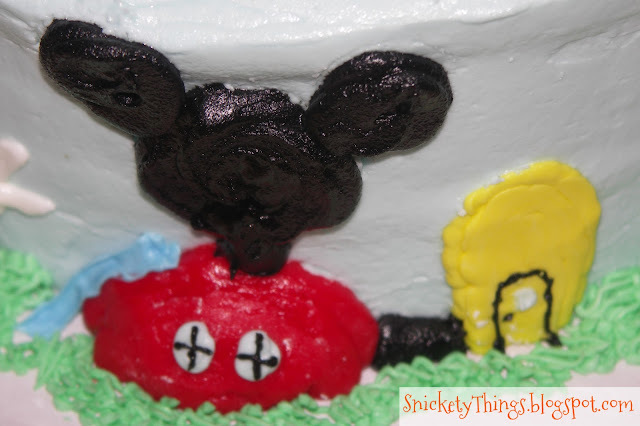 I went to work scouring the internet for pictures of a cake that I would be able to make for her. Most of the MMC cakes were of the Clubhouse itself, either drawn on a sheet cake or made in 3D. While some were nice, they weren't really what I had envisioned. This cake was really easy. It is two six inch layers stacked on two eight inch layers. If you notice it is leaning a bit. Yeah, I didn't put any supports in it. Looking back I am probably lucky it didn't fall over. I iced the entire cake in a light blue to mimic sky. I then started on making the Clubhouse and Toodles. I piped the red icing (red icing from a Wilton tube since I didn't need much) first, to form the "body" of the house using a #7 Wilton tip. I made sure it came off the cake for a 3D effect. Next, I used a #5 Wilton tip to and the head in black (also from a tube). I used the same #5 tip to draw the leg. I made a small amount of yellow icing and piped the shoe using a #3 Wilton tip. The windows are just dabs of white from and #3 Wilton tip and the black lines were drawn on the windows and the shoe with a #1 Wilton tip. The slide was made with a #79 Wilton tip to make it look a bit like an actual slide. I was a bit wobbly though. I used the #5 tip to make the arm for the balloon glove and the #3 tip for the white glove. The glove stripes were added with the #1 tip. There is also a better shot of the slide. 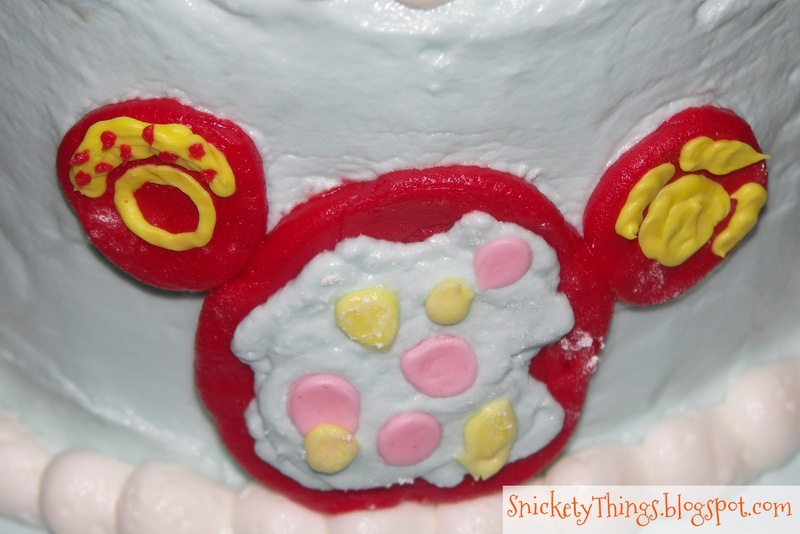 This shot gives you an idea of how far the "body" comes out from the cake. Here is Toodles. 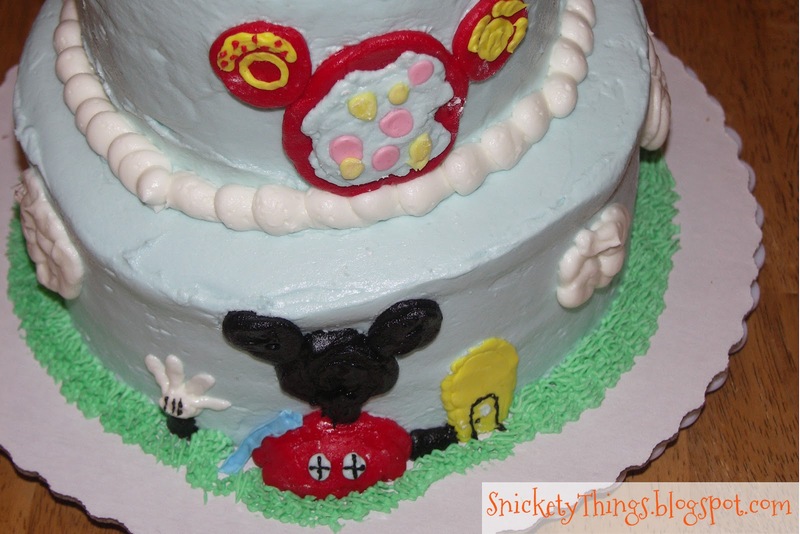 I don't think you can have a Mickey Mouse Clubhouse cake with Toodles somewhere. I used the #7 Wilton tip to make the back of Toodles, then used the same blue as the sky to make his screen. The yellow accents were added with a #3 Wilton tip, and those small red dots were made using a #1 Wilton tip. I mixed my yellow and red with a bit of white to get the lighter colored dots for the screen. They were pipped with a #3 tip then pressed flat with my finger. I also didn't realize how big of a fan my daughter really was of this show until she pointed out that my Toodles was backwards. She was right, this is a mirror image of how he actually looks. 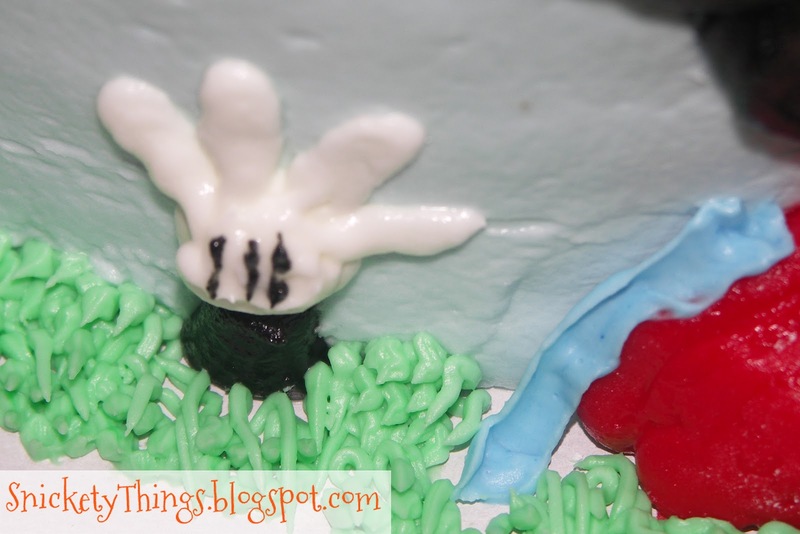 The bottom border is just made with the Wilton #233 tip to look like grass. 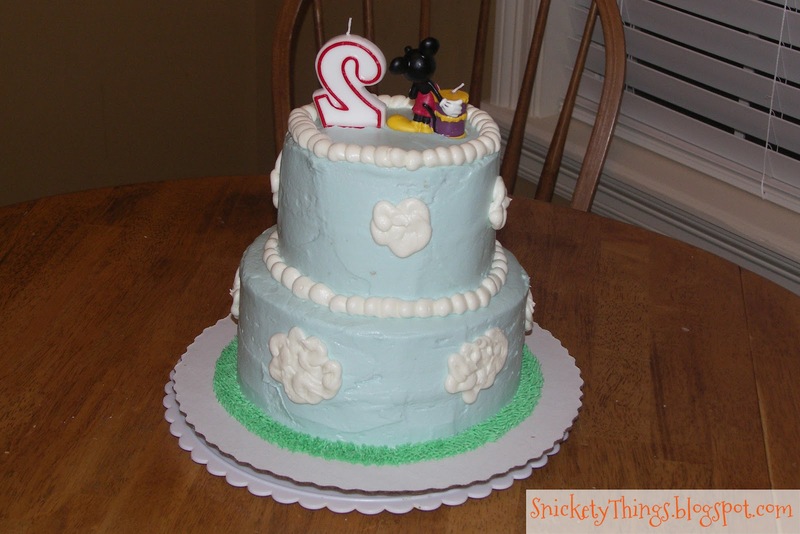 To fill in the rest of the cake I simply added clouds made with the #7 Wilton tip. Any question feel free to ask! Thanks. I'm already a follower of yours! My kid would love this. I'm going to pin it so I can refer back when we get closer to his birthday! Great Job! Saw your post on 36th Ave. 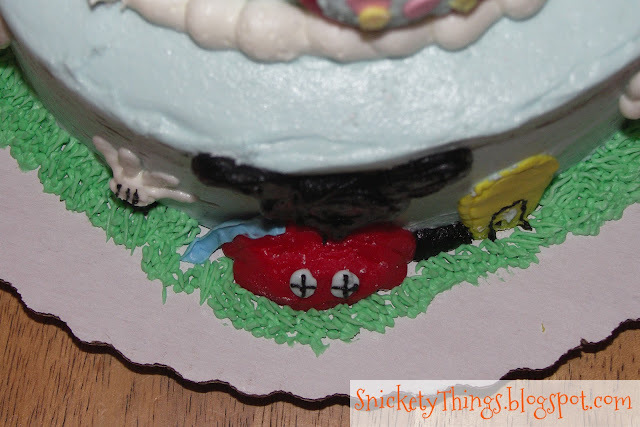 I'm just getting ready to do a Mario cake so it's fun to see others enjoy making cakes for their kids! I'm sure she was in LOVE! Thank you. I'd love to see pics of Mario! what a great job, my kid never got into this show, but he loves mickey mouse. Thanks. My oldest never got into it either, but that younger one is obsessed. So cute! I wish I had ANY cake decorating skills, whatsoever! Thank you! It is easier than you think to do it. So cute - nice job! Su cute! I love the details..
that is a beautiful creation!! What a great job you did! I love all of the detail. I'm a bit skeptical of your statement that it was easy, though. I have tried to make (very simple) cakes/cupcakes for both of my son's birthdays, and I have failed miserably. Thank you! A lot of the things I have tried have failed. I just keep trying. Post pictures if you do, and thanks! Thanks for linking up to Serenity Saturday. Very cute cake! Nice job!